BTN's Richard Cawthorne combined a visit to see developments at Lyon St-Exupéry Airport with a couple of days in the city it serves. As he reports, there is plenty to enjoy. Fittingly for one of the venues for Euro 2016, now just a distant memory, Lyon in east-central France is a city of two halves. Visitors other than soccer fans might know it as a gateway to some of the best skiing, but it doesn’t take long to discover there is much more to this Unesco World Heritage Site than that. The two halves are made up of the site of the original Roman city of Lugdunum, which, with later additions, is gathered conveniently on and around the hill called Fourvière, and the later settlements below, spread out around Lyon’s not one but two rivers, the Rhone and the Saône. 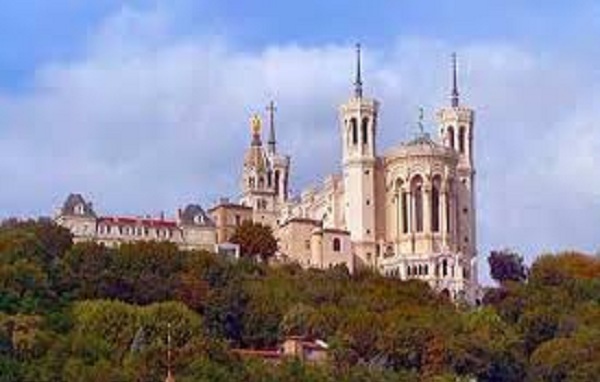 Fourvière, the name of the district as well as the hill, is a commanding presence partly for its sense of history but also because it is now crowned by the very large and very white Basilica of the Virgin. Reminiscent of Sacré Coeur in Paris, it rewards a visit and the trip also provides a glimpse of one of Lyon’s most celebrated monuments, a copy of the third stage of the Eiffel Tower. Known rather prosaically as the Tour Métallique de Fourvière, or metallic tower of Fourvière", the 85.9m structure was built between 1892 and 1894 apparently to satisfy civic pride. During the Exposition Universelle, or World’s Fair, of 1914 in Lyon, it had a restaurant and lift taking 22 people at a time to the top. It was then used as an observation tower until late 1953 and although no longer open to the public now serves as a television tower. Thanks to the hill on which it stands, it is the highest point in Lyon at 372m, which the locals are pleased to remind you makes it higher than the real thing in Paris. Fouvrière, which also boasts a well-preserved Roman amphitheatre, is served by a funicular railway, which makes the trip up easy. However, visitors are encouraged to walk down when they are finished so they can admire the gardens on one side and ancient park on the other that decorate the hill. Easier said than done. The steps are steep and there are a lot of them and the descent requires some care. Given that, the gardens are a treat. Back at ground level, the rest of Lyon spreads out all around with all the experiences visitors might expect from France’s third city and self-proclaimed gastronomic capital, a boast much debated in foodie circles but fiercely adhered to here. To get an idea of the layout of a place, I always recommend the hop-on, hop-off tourist bus tours, which are in good heart in Lyon and offer after-dark itineraries and bus-and-boat trips too. With 2,000 years of history to explore, including medieval and Renaissance architecture in Vieux Lyon, the buses are kept particularly busy. Part of the tour features the history of the silk-weaving industry, once prominent in Lyon, which gave rise to the traboules, covered passageways between the old streets allowing easy – and sometimes clandestine – access to premises out of sight of the authorities. They also came in useful for Resistance fighters in Lyon during World War II. The mighty Lyon Cathedral in the massive Place Saint-Jean is not only a treasure-house for artefacts from the 14th-century but a central point for much of the city’s café, restaurant and club life that has grown up around it. Other top-10 sights to see include the Museum of Fine Arts, regarded as second only to the Louvre, and the extensive Parc de la Tete D’Or, laid out in the 19 th century complete with a boating lake. For those who prefer more up-to-date attractions, the modern city of Lyon also has plenty to show off, characterised by the striking buildings, including the Musée des Confluences, a science centre and anthropology museum which opened in December 2014, in the redeveloped docklands area. Another useful aid to sightseeing is the Lyon City Card at €21.90 for one day, €29.90 for two days or €37.90 for three, available online or from the tourist office and including unlimited access to 19 of the most prestigious local museums. It also qualifies holders for special rates on guided tours, self-guided audio tours and boat tours between April and October as well as unlimited use of public transport. The tourist office can also arrange private walking tours themed around gourmet food, Roman theatres and Lyon at night. And talking of food, visitors are spoiled for choice among the many restaurants of all kinds, from the haute cuisine of local star chef Paul Bocuse to the hearty quenelles (fish dumplings) and sausages of the no-frills Lyon style of home cooking known as bouchon. Among the best-known exponents of this is master chef Joseph Viola, who runs the Daniel et Denise group of three restaurants. I tried the tasting menu at the Saint-Jean branch in Vieux Lyon, sampling dishes including cervelle de Canut followed by a pate en croute of duck foie gras and calf sweetbread and later a fish quenelle with Nantua crawfish sauce. Probably not for the faint-hearted but a definite culinary adventure and all the more enjoyable for that. My schedule dictated I fly to Lyon via easyJet out of Luton and return on British Airways to Heathrow. Both flights did what they were supposed to and I had a chance to explore Lyon’s pace-setting airport and the changes taking place there (see BTN 11 July). If you are already familiar with the city, or have more time than I did, the BA destination guide notes that some of the most beautiful parts of rural France are nearby. It recommendations include, and I quote, the medieval walled city of Pérouges, just beyond the city; the Alps and the lakeside resort of Annecy, less than two hours’ drive away, and the stark Forez range of the Massif Central – “well off the beaten track and under an hour’s drive to the west”. There's also a nice express tram, RhonExpress, between city and airport.